This month was pretty scary. I made a big change to Kollecto to make it scalable for the hundreds of active users we now have. In a lot of ways it felt like I was starting everything from scratch- moving from a 1:1 advisory model & to a personalized, but scalable (1: many) model. Last month, I pushed myself to do regular ‘codeless product sprints’. I’ve done three major ones so far and am now I’m committing to doing small ‘codeless product sprint’ each week. I’m using this blog as a way to hold myself accountable! 🙂 So I’ll be writing weekly about new features I’m adding to Kollecto. Plus I’ll be documenting the lessons learned from getting hundreds or users to engage with the features. For the past 6 months, we’ve been asking open-endedquestions about what kind of art people like/ want. A) most people didn’t have the ‘art vocabulary’ to tell us what they like. B) The process didn’tallow us to easily group people with similar taste. This is actually something we used to do. We stopped allowing clients to rate artwork because it required making a new client presentation for each user!! But as we intoduced scalable categories, we added the ability to rate each piece again! 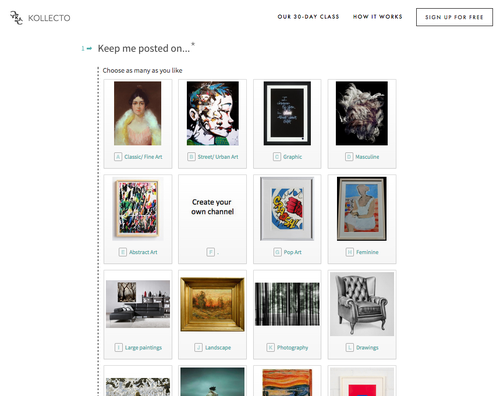 Created a Google Form to show art in each category & let clients rate the pieces. 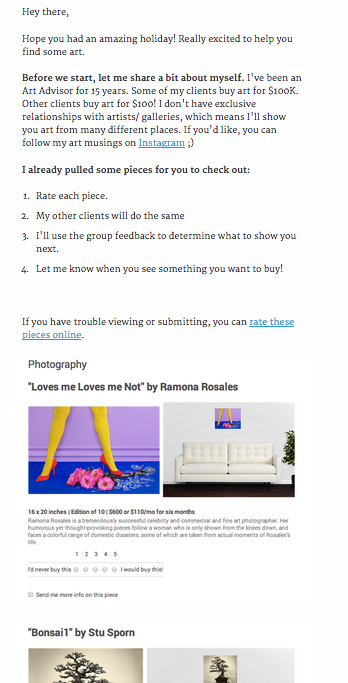 Each client got an email like this. But it turned out that lots of people found art they liked in categories they didn’t subscribe to! Learning of the Sprint= By accident, I learned that this targeted service doesn’t need to be perfectly targeted. Sometimes it’s best to include some suprises in your product.